It's the details that make all the difference, and the Highwheeler™ bike rack has just that. The addition of handle bars onto the standard Highwheeler™ bike rack adds the finishing touch to complete this old world style bike rack. Line your sidewalk with these whimsical bike racks that secure two bikes each, and instantly add vintage charm to your outdoor facility. This bike rack will comfortably park two bikes, one on each side. 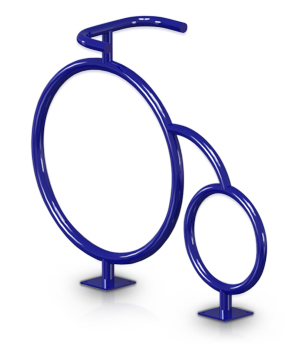 The unique design of this bike rack is definitely a crowd pleaser and makes your facility a little more interesting.